From New Jersey. They sound like Cannibal Corpse meets Ripping Corpse meets Dismember. 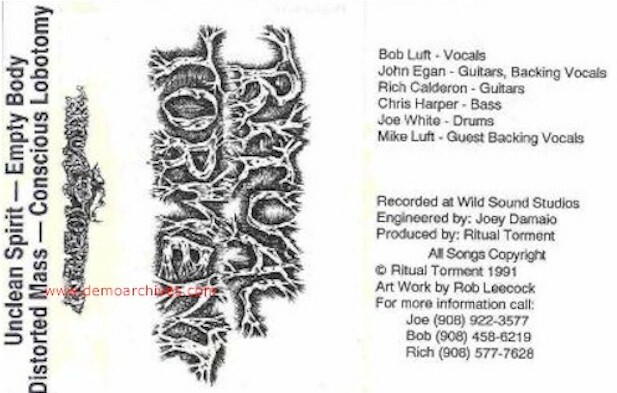 Bob Luft bellows the evil lyrics in a classic low-end death style, and bassist Chris Harper and drummer Joe White keep the rhythm going in a tight speedy yet tearing fashion. The guitar work is shared by John Egan and Rich Calderon, and is pretty tight and concise. Changed their name to Gaffed. Xeroxed covers. Recorded onto regular NON studio tapes.